PALMDALE – Organizers need your help to bring a traditional Christmas to 100 homeless families in the Antelope Valley. The third annual One Way Up Gift of Love event takes place from 5 to 8 p.m., Wednesday, December 18 at Angel’s Bingo Hall, located at 2101 East Palmdale Boulevard. 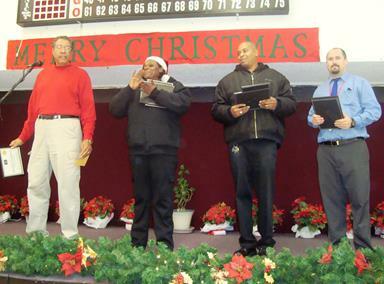 The event will feature musical performances by the Pete Knight High School band; a traditional holiday dinner with all the trimmings; a special appearance by Santa Claus to distribute toys to all the children; and a Christmas tree trimming, according to One Way Up CEO Cynthia Beverly. The annual Gift of Love event was established to ensure a merry Christmas for local disadvantaged families who are displaced over the holidays. “The ones living inside the hotels and motels,” Beverly said, adding that she is targeting the families receiving services through the Los Angeles County Department of Public Social Services (DPSS) Homeless Assistance Program. Beverly said she too was living in a hotel, at one point, so she knows firsthand how stressful this can be for families, especially during the holidays. (Read her story here). Beverly said she has already identified about 40 local families and invited them to the event. To qualify, families must be experiencing extreme economic hardship, or receiving services through the DPSS Homeless Assistance Program and temporarily staying in a hotel, motel or shelter. Beverly is hoping to “adopt” up to 100 local families for the Gift of Love event. If you or someone you know qualifies for the annual One Way Up Gift of Love event, contact Cynthia Beverly at 661-202-8715. Organizers are still accepting new, unwrapped toys, certain canned foods, or monetary donations to help support the event. You may drop off your donation to Angel’s Bingo Hall at 2101 East Palmdale Boulevard, or contact 661-202-8715 for more information. 1 comment for "Donations needed for One Way Up Gift of Love event"